It is said that the Buddha prophesied that someone would come after him who would clear up any confusion regarding Buddha-dharma. Nagarjuna is considered to be that person. Often called The Second Buddha, Arya [noble] Nagarjuna (2nd century CE) was from a wealthy South Indian Brahmin family. He is considered a terton (hidden-text revealer) as well as a philosopher. Nagarjuna is sometimes called the First of "The Six Scholarly Ornaments," a group that also includes Aryadeva, Asanga, Vasubandhu, Dignaga, and Dharmakirti. Two groups of texts are attributed to him. The Collections of Reasonings gives the Buddha's intentions in Turning the Wheel of Dharma for a Second Time. The Collection of Praises concerns the Third Turning of the Wheel of Dharma. Khenpo Tsultrim Gyamtso explains that in it we come to understand via meditation that the dharmadhatu and our own Buddha potential are the same. Elegant Sayings of Nagarjuna, w. comments by the Sakya Pandita. 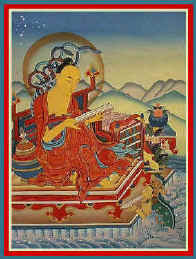 He is best known for his explanation of the term shunyata (Emptiness, or Open-ness) that is developed in that treatise. The volumes are kept today still, in a temple dedicated to him in Kathmandu. In those days, there was a terrible famine in the land that grievously affected the monks, for they were supported only by the surrounding community's generosity. Nagarjuna is said to have gone to a distant planet and returned with a Philosopher's Stone that could turn base metals into gold. With the profit he earned from that enterprise he supported the monastery for six years, but when the monks learned that he had broken a major precept by handling gold, they expelled him. When Nagarjuna left the monastery, he went to live in the forest where he mastered all the accomplishments of the yogi. He could make detailed mandalas, prepare the ingredients for the finest incense, and practice astrology. He is believed to have encountered, and having attained the highest siddhis, subdued yakshas, ghouls and vampires. He is also said to have found a copper casket containing the text of the Hayagriva tantra, in the Shankarakuta stupa at the Sitavana charnel ground near Bodhgaya. He is also known for his revelation of the Green Tara practice. He established and built many temples and stupas with special clay he had received from the nagas. "Whoever is born has to die; whoever are together have to separate; whatever is saved has to be used; whatever is created is impermanent. So do not be upset over these laws of nature." "The Conqueror [Buddha] taught openness [sunyata: emptiness] as the refutation of all [any] views. But those who hold openness as a view are called irremediable." "Openness [sunyata] wrongly conceived destroys the dimly witted. It is like a snake grasped by the head, or a garbled incantation." Verses From the Center (Mula-madhyamaka-karika) trans. S. Batchelor. Nagarjuna revealed that one of the debaters had been an ant in a previous life, and was accidentally killed by Nagarjuna with a blade of kusha grass. This person -- the only being who could harm him in return -- now had the power to kill him which he did, using only a stalk of that same kusha grass. Aryadeva, the second of The Six Ornaments, continued his teaching traditions. Nagarjuna's remains, with the exception of his head, are said to be preserved at Shri Pravarta. Nagarjuna's head that was severed by a blade of kusha grass is kept in this walled-enclosure, guarded by the tiger on its door, that is a part of the Swayambhu complex. Nagarjun, [ancient case suffixes are dropped in Hindi and other contemporary languages] as he is called in India and Nepal, is believed by Nepalis to have retired to Nagarjun Mountain near Katmandu. A person with a similar name was the abbot of Nalanda, the great Buddhist monastic university near Bodhgaya, since there is no evidence that the institution was founded before the third century CE. There was also an alchemist by that name who may also have become identified with the great teacher Nagarjuna. Therefore there is wide disagreement as to how long Nagarjuna lived, with estimates as high as 300 years. The Chinese believe that he visited and taught there. Also, he is credited by Japanese Buddhists with having taught the complete path of reliance on Amitabha. In any case, teachings attributed to Nagarjuna are today still widely followed in all the countries where Mahayana Buddhism is practiced. Named for Acharya [master-teacher] Nagarjuna, Nagarjuna Sagar is a place 150 kms. from Hyderabad in Andhra Pradesh, India. It is where the Mahachaitya, most sacred of stupas [Tib. chorten] is located. The Brahmi inscription states it contains relics of the Buddha. The Problem of the Historical Nagarjuna Revisited, Ian Mabbett's article. "Nagarjuna (c.150-250 CE) ... realized at a profound level the difficulties of carrying out Buddhist discourse in the medium of language, and the degree of attachment that could occur with even such subtle concepts as shunyata. Therefore he endeavored to prevent people from falling into the error of attaching to Emptiness as a "something" or as "non-existence." He made his project an exercise in consciousness that sought to free people from being limited in thought by the linguistic options of "this or that" and "existence or non-existence." He did this by taking Buddhist philosophical terms and putting them into his formula of "neither x nor not-x." According to this formula, existence is "neither empty nor not empty," "neither samsara nor nirvana." Nagarjuna's teachings are not something new ontologically speaking, but were developments toward a more advanced logical form that can be seen in his Madhyamaka-karikas. In these texts, he strove to stop the reification of the concept of emptiness by: (1) stressing the non-difference between emptiness and dependent origination; (2) by emphasizing the understanding of emptiness as a mental attitude which pays attention to the non-attachment to concepts and theories. That is, emptiness should not be made into a theory to be clung to (as are other philosophical and religious doctrines). According to Nagarjuna, he who does so is like "a customer to whom a merchant has said that he has nothing to sell and the customer now asks to buy this 'nothing' and carry it home." For Nagarjuna, emptiness should not be interpreted ontologically, but rather in the way of the parable of the raft: The Buddhist teaching (especially shunyata), is like the raft one constructs for the crossing of a river. Once the river is crossed, the purpose of the raft has been served. It may now be discarded. The same is true of emptiness: it should not be held on to; one who does hold on to it will have trouble functioning in life. In this sense, emptiness could also be compared to a laxative: once the obstruction has passed, there is no need to continue taking it. Nagarjuna wrote extensively, and his teachings resulted in the formation of an Indian school called Madhyamika or the "Middle Way School." This school was later transmitted to China [as] San-lun Tsung (School of the Three Treatises) where, although it died out as an independent sect, had great influence on the formation of Chinese Buddhist philosophy." ~ Madhyamika: The Teaching of the Middle Way at Toyo Gakuen University, Japan. (9/2/1998 link to Zen Buddhism Electronic forum is no longer available in 2009 but on the University web site, A. C. Muller is still listed among the staff. "A classic is a classic because it engenders multiple meanings. The most lasting truths are found in the least reductive configurations of the largest possible number of conflicting interpretations. In other words, the most useful interpretation may well be one that takes into account as many previous interpretations as possible and attempts to disclose the ways in which these earlier readings made sense, both to the interpretative scholar and to his or her readers . . . .
Every reading of a text--including, of course, the most carefully contextualized and historicized readings--will, in some ways, be unavoidably determined by some set of prejudgments. The choice is, therefore, not between good readings, undetermined by irrelevant considerations, and bad readings, rendered inaccurate by interpretive prejudice. The choice between one reading and an even better reading is a difference in degree and not in kind. Within any set of rules for what counts as a desirable interpretation, choices between more and less preferable readings of texts can and will be made. And a study such as this suggests that our conventionally agreed-on rules of interpretation--the rules that tell us what is relevant, and what sorts of judgments are harmfully prejudiced--are anything but constant. Our preferences in regard to what constitutes a good interpretation are just as determined as our readings themselves... . Nagarjuna's celebrated warnings about the perils of wrongly understanding sunyata [... ] or holding this non-position as if it constituted a philosophical view in itself ("Those for whom sunyata is itself a theory, I call incurable." ch. 13, v. 8) thus become doubly important in the new Western climate of skepticism about philosophical theorizing. Nagarjuna ... did not intend to substitute his theory for those of his opponents. His only intention...was to cure others of the philosophical illness ... . Nagarjuna was convinced, as a Buddhist, that the salvation of all living beings was at issue ... . This study offers neither an indictment of the comparative enterprise nor a suggestion that any new interpretive perspective . . . will offer anything like a 'final and infallible,' or even a wholly satisfying, interpretation. A new interpretation is often a response to a new set of critical concerns, not a solution to a formerly unsolved or poorly solved puzzle. Looked at in this way, the post-Wittgensteinian [Western philosopher,1889 - 1951] fondness for Madhyamika Buddhism is not less determined by contemporary trends than was the late-nineteenth-century fascination with Advaita Vedanta [a Hindu school of non-dualism]. What we do seem to have is a collection of intelligent misreadings, and that may be enough . . . . We should not be surprised that interpretation is not an exact science. After all, translation is not an exact science. Science is not an exact science." Garfield, Jay L. The Fundamental Wisdom of the Middle Way: Nagarjuna's Mulamadhyamakakarika. Oxford U P, 1995. Inada, Kenneth. Nagarjuna: A Translation of his Mulamadhyamakakarika. Tokyo: The Hokuseido Press, 1970. Sprung, Mervyn. Lucid Exposition of the Middle Way. Boulder: Prajna Press, 1979. Streng, Frederick J. Emptiness: A Study in Religious Meaning. Nashville: Abingdon Press, 1967. Philosopher's Stone: a term more appropriate to the European alchemical tradition. It may be that the description of the wisdom of the nagas as a Wish-fulfilling Jewel led some people to misunderstand what he had revealed as a kind of object that confers worldly wealth. The tangka of Nagarjuna was from the TibetShop web site.